My husband, Chaim, and I are trying to find a lovely Jewish name for our baby girl. We have picked a middle name for her. It is Tzofiya. It means "guardian" and is pronounced like Sofia is. We want something pronounceable but still true to her Israeli heritage. We cannot name her after close family members so Arielle/Ariella and Rachel are out. Chaim's mother wants to name her Adina but I do not think Adina Tzofiya sounds right together. Can you help us? At the risk of upsetting your Jewish mother-in-law (typically someone you NEVER want to upset), you are right. For a first name that flows better but retains the same tone, name your daughter Eden Tzofiya. If our baby is a boy, we have a dilemma. We cannot agree on a first name to go with David Decker. I need a suggestion and the middle name of David has to remain if I am not to be disowned by my father, and three "D" names would be anathema. If he has trouble with anathema, then just give him his inhaler. It'll stop his wheezing right away. Oh, wait, I'm thinking of asthma. For a name that will take your breath away, name him Jonathan David Decker. Please help us genie! We are unexpectedly expecting baby #3 (surprise!) and we need a great name that flows with our other children's names, Nia Joy and Zoe Anai. My husband's name is Jack Kenneth (both namesakes). I'd like to include a namesake for baby #3 but I have the names Gloria Anne & Daniel John (my parents) and Marjorie Anne & Larry Kenneth (my husband's parents) to work with. I need help picking out a name for a little girl. One that's beautiful, maybe even elegant, but can have a nice tough nickname. You've presented an interesting challenge. A name that is elegant, but sounds tough when shortened. A study in opposites. Name the girl Samantha for a classic and elegant name. Use the nickname Sam when it's time to get tough. Hi Genie. I've been stumped for a long time on a girl name that would fit perfectly with the last name Xavier. I absolutely love names from Greek mythology like my own name, Astraea, but I also love names that are full of meaning and history. I am very fond of unique names like Ariadne or Callista rather than the usual Helen or Chloe that most people recommend to me. Any suggestions? I try to research the meaning of names from mythology, but it's all Greek to me. For a name fit for a demigod, I give you Aurora Selene Xavier. So I have been using you for a while to find the perfect name. I have also been using many other sites. As I was looking around for a perfect name for my baby that is soon to come, January came up. I absolutely ADORE this name, but I'm afraid that January would get picked on in school. Along with that I can't seem to find a perfect MIDDLE name. Please help! January is a perfectly acceptable first name, as evidenced by the actress January Jones. Many children are getting unique and unusual names these days. I think January Ruth would be a great way to start the year. We are having twin boys! We are pretty much set on Rhys William for one of them. We go back and forth with other names for the other twin. We need a suggestion. We would like the middle name to be just the initial V. It also needs to fit with older brother Caleb. Thanks for your help! Name your sons Rhys and Selah. People may ask why you named your son Selah V, but "that's life." The hubby and I are both sci-fi geeks, so we gave our first daughter the space-themed name of Terra Halley (as in Halley's Comet). We'd like to keep with the space theme for baby #2 (also a girl). My hubby's side of the family is British, so something they could easily pronounce. Any advice? Thanks! Are the Brits known for being especially bad at pronouncing things? When I think of "Leicester" and "Gloucester" and "aluminum" and... Oh my. Yes, I see your point. For your little space cadet, I give you Aurora Celeste. Hi! We have 5 daughters and are now having a BOY! Our last name is Holley and we're looking for our BOY to have an ALL BOY name, since his last name is already quite girly and he will be raised in a house FULL of girls. Thanks! I foresee many a dress-up session from his sisters for the boy Holley. Let's give him the name Hunter Jackson to help him fend off his sisterly foes. So, I really like the name Harriet (Hattie for short), but people seem to think it's too old-fashioned. 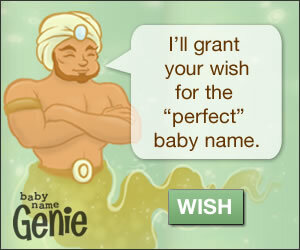 Also, I wished for the "perfect" name about fourteen times and Harriet never came up. Am I just a weirdo? My brother says Gwenifer is way too weird and I'm crazy to prefer it to Gwenivere, so. . . So... You are just a weirdo.